25 x 25 mm 18K white gold case set with 36 brilliant-cut diamonds (approx. 0.6 ct), 6.2 mm thick, diamond bezel, silvered dial, 56P quartz movement, 18K white gold bracelet set with 140 brilliant-cut diamonds (approx. 12.2 cts), integrated buckle set with 18 brilliant-cut diamonds (approx. 0.1 ct). Water resistant to 03 ATM. 32 x 19.4 mm 18K white gold case set with 69 brilliant-cut diamonds (approx. 0.5 ct), 6.6 mm thick, diamond bezel, gem set dial with 331 brilliant-cut diamonds (approx. 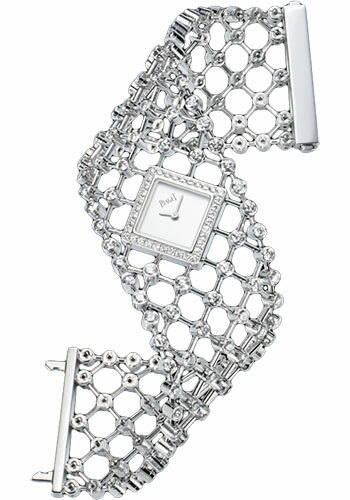 1.4 ct), 56P quartz movement, 18K white gold bracelet, integrated buckle. Water resistant to 03 ATM. 32 x 19.4 mm 18K white gold case set with 69 brilliant-cut diamonds (approx. 0.5 ct), 6.6 mm thick, diamond bezel, pink opal dial, 56P quartz movement, 18K white gold bracelet, integrated buckle. Water resistant to 03 ATM.